Goodbye from Holyrood Live on Wednesday 12 September 2018. Scotland's health boards have been ordered to "immediately" halt the use of vaginal mesh implants in surgery. Communities Secretary Aileen Campbell praises the work of Womankind in her own constituency. She says the social enterprise should never let governments off the hook for their obligations and points to the child poverty action plan published by the Scottish government earlier this year. In the short time since its publication, it is already delivering tangible change Ms Campbell states. She points to the school clothing grant, which will see all eligible families have access to the same level of support for uniforms. The cabinet secretary asserts UK government welfare cuts have and continue to push families into poverty. The Scottish government will continue to work with social enterprise to give every child an opportunity to flourish, Ms Campbell concludes. Poverty rates in Scotland are continuing to rise, official figures have suggested. In each year between2014 and 2017, one million people in Scotlandwere living in poverty, which was up slightly on previous years. The latest statistics also show 8% of people are in "persistent poverty". The Scottish government said it was "absolutely committed" to ending poverty and would set out its plan to eradicate child poverty by 2030. Labour MSP James Kelly says the work of Apparel Xchange is excellent. Mr Kelly points out some families cannot afford uniforms and the social enterprise redistributing school uniforms lets them get them at a lower cost and is also environmentally friendly. He also praises the work of CPAG on this issue. One in three children will be living in absolute poverty by 2030/31, according to new analysis published by the Scottish government. It commissioned independent projections as part of work to draw up a poverty action plan. Ministers said the figures reflected the damage caused by UK government welfare cuts. 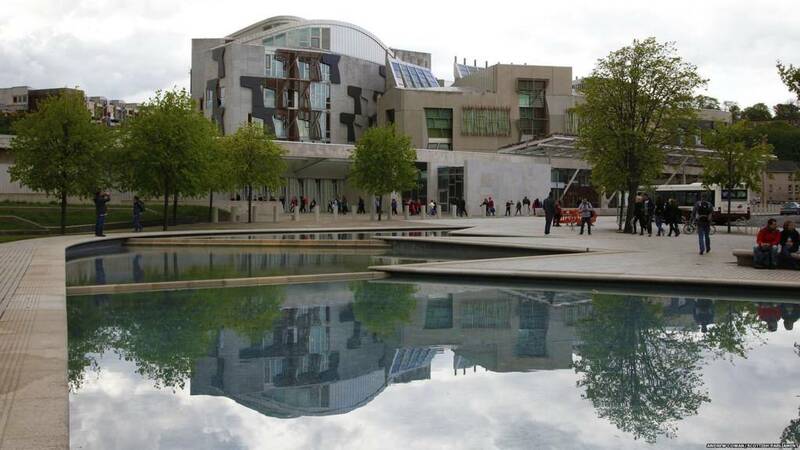 Opposition parties said the SNP had to do more to tackle the "complex causes" of deprivation. The Scottish government commissioned the research into child poverty levels as part of its Tackling Poverty Delivery plan, due to be published later this week. Tory MSP Michelle Ballantyne praises the work of a social enterprise in her own regions and says it is vital to support the development of social enterprise. Ms Ballantyne then goes on to highlight some comments made to her by Alex, a 16-year-old currently working in her office. Alex said that mental health, lack of family structure and falling education standards have been overlooked when considering child poverty. He suggests all parties have too narrow a view of poverty and have therefore attempted to tackle it in flawed ways. Poverty effects communities, not just individuals, Alex wrote. Scotland's largest teaching union, the EIS, is arguing that teachers need help to tackle the impact of poverty on children's education. Many teachers are concerned that there is little they can do about some of the issues they see in their classrooms. It is hard to say with absolute certainty that teachers are seeing more of the effects of poverty and disadvantage. The evidence of its day-to-day impact on schoolchildren is largely anecdotal and not formally recorded by councils or the government. However, the largest teachers union, the EIS, has been monitoring the issue since 2013 and believes the problem is worsening. Issues such as welfare changes, local unemployment black spots and zero-hours contracts are sometimes cited. Mr Harvie insists basic education should be free today and the school day costs should be met. These costs must be minimised to make sure all young people have access to education regardless of their family income, he insists. The Scottish Green co-convener calls on the UK government to change its austerity and welfare policies. Scottish Green co-convener Patrick Harvie welcomes to opportunity to highlight the work of Apparel Xchange. He says the social enterprise works to reduce both the financial and environmental cost of school uniforms through reuse. Mr Harvie praises the low price of the uniforms and also highlights a scheme to provide free uniforms to families unable to afford them, including asylum seekers and refugees. Social enterprise has a really good knack of joining up social, economic and environmental policies, he states. Scottish Green Party co-convener Patrick Harvie leads a member's debate celebrating the work of the Glasgow-based social enterprise, Apparel Xchange. It aims to promote reuse and recycling of school uniforms to reduce costs to families. The motion explains school uniforms cost an average of £130 per year which many parents struggle to pay. It also praises the work done by the Child Poverty Action Group and others on the costs of the school day. Ms Freeman says the challenge is to keep physical activity beyond school, particularly for young woman, and she says the Scottish Womens' football team qualifying for the World Cup really matters. Learning from reviews from those suicides that do happen will help going forward, she says. The health secretary concludes saying "in Scotland every life does matter." Health Secretary Jeanne Freeman begins by replying to Anas Sarwar's query, saying the £3m for mental health services is additional to the £2m already allocated. Ms Freeman explains the leadership group's role is to provide recommendations on priorities and the use of resources to the minister and indeed to Cosla. She thanks all those who helped create the Suicide Prevention Action Plan. The cabinet secretary tells the chamber men are the single group that has shown an increase in suicide in recent years. Tory MSP Miles Briggs states more clarity is needed on the resources which will back up the plan. Delivering on the plan is vital, he says. There is much to be done in preventing suicide in our economically disadvantaged communities notes the Tory MSP. He hopes the leadership group will therefore give local programmes a strong focus and backing. The Conservative health spokesperson backs having trauma-trained people within public services. Referring to the death of Scott Hutchison of band Frightened Rabbit earlier this year, Mr Briggs says this increased understanding of how mental health impacts men in particular. "Every single life really does matter," he concludes.